Do you have New Year’s writing resolutions? Are you ready to freshen your voice? Want tips on writing with authenticity, originality and passion? 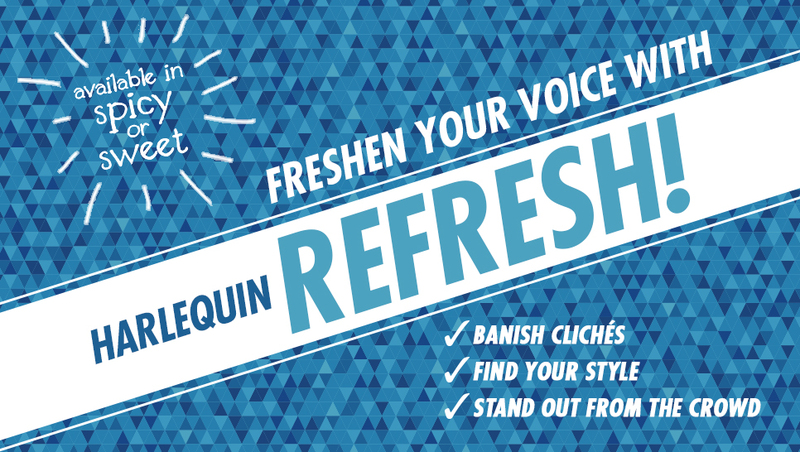 Welcome to Harlequin REFRESH! on the So You Think You Can Write blog. Each week in January we’ll feature posts by editors and authors on the theme of voice in romance writing. We’ll be looking at topics such as avoiding clichés, developing your own voice, catching an editor’s eye, and keeping things fresh. We hope you’ll share your writing questions and challenges in the comments, get inspired, and pick up tips to help find a writing voice that’s contemporary, original, heartfelt, and authentically you. Any questions on voice you’d like answered? Let us know in the comments! And check in with us next week as we get started! Harlequin REFRESH! Banish stylistic cliches! I have nearly finished my romantic novel “The Irishman’s Women,” and emailed Mills and d Boon about it. Apparently they are not accepting submissions at present. My book is 68000 words long and is largely set in an artificial Rainforest. One of the women is a witch who can fly on a giant bird. She is the ex lover of the Irishman and is jealous to the point of murder. Of course I can change the bird for a car at this stage. This is so awesome!! I can really use all this information!! I don’t have a specific question about voice, but I would appreciate any advice on the matter. Thanks so much!! This is a wonderful idea! I am looking forward to reading the upcoming posts.